This is New York too. While strolling in the Lower East Side on Orchard Street on Saturday night, I happened upon this doorway. 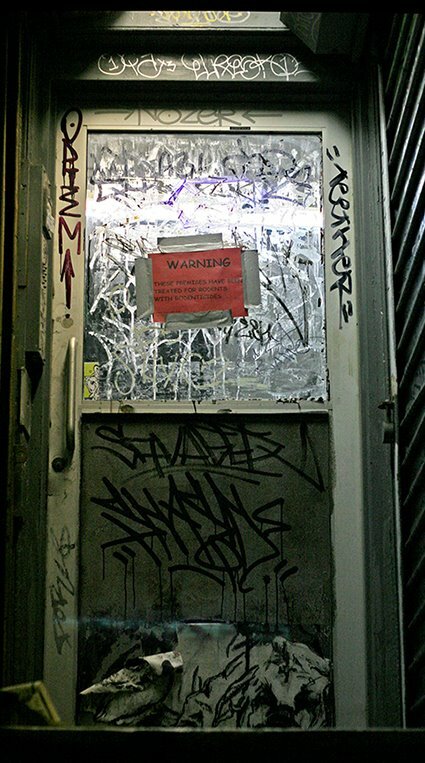 It had the edge department well covered: graffiti, garbage, poorly lit, a bare fluorescent bulb, heavy duty roll gates with padlocks and a sign warning of rodents and rodenticides fastened with duct tape. See closeup here. Does this affect desirability of the neighborhood? Not at all. Of course, real estate prices will not be quite as high as, say, an apartment on the Gold Coast - 5th Avenue in the 70s with Central Park views. There is a large demographic that would prefer the Lower East Side to the Upper East Side, SoHo, Tribeca or the Upper West Side, for a time. There's certainly no debating the fact the the Lower East Side and the East Village are two of the most exciting neighborhoods in the city with the widest range of restaurants, bars, theaters, and music clubs. And I am sure most residents are content to live out their entire lives there. Unless big money is at hand or added to the equation. Then, for many, the residence becomes a passing fancy, fad, a toy to be discarded or a place one has outgrown, followed by a move uptown or out of town. The charms of duct tape and rodenticide give way to those of the Dakota, Beresford or San Remo. And edge is only a taxi or limo ride away. Take the Silk Building, e.g., above the former Tower Records at 4th Street and Broadway. The penthouse apartment has been a revolving door for the affluent - it has seen Keith Richards, Cher, Britney Spears. There are a handful of extraordinary buildings downtown like the Police Building and many of the well-heeled do remain downtown, but they are few. Once a image statement has been made, most leave. After all, this really is a neighborhood that caters more to the young and restless than the established and rested. Related Postings: Vegan Chic, Bluestockings, Unkindest Cut, Rats R Us, Rats Gone Wild, The Dark Ages, Wildlife Control.